I've noticed for some time what looks like the occasional "scratch" on the stuff I'm engraving/cutting - put it down to using a bucket load of off-cuts until now when I'm making up a celebration plaque for a friend. I've done 2 now on brand new acrylic sheet which I inspected before hand and both have come out with what I think is a mis-fire of the laser and want to know if anyone else has seen this. Right now, I don't know if it's a software glitch, some sort of noise on the wires or something wrong with the internals of the laser cutter itself. So what now? Any clues? 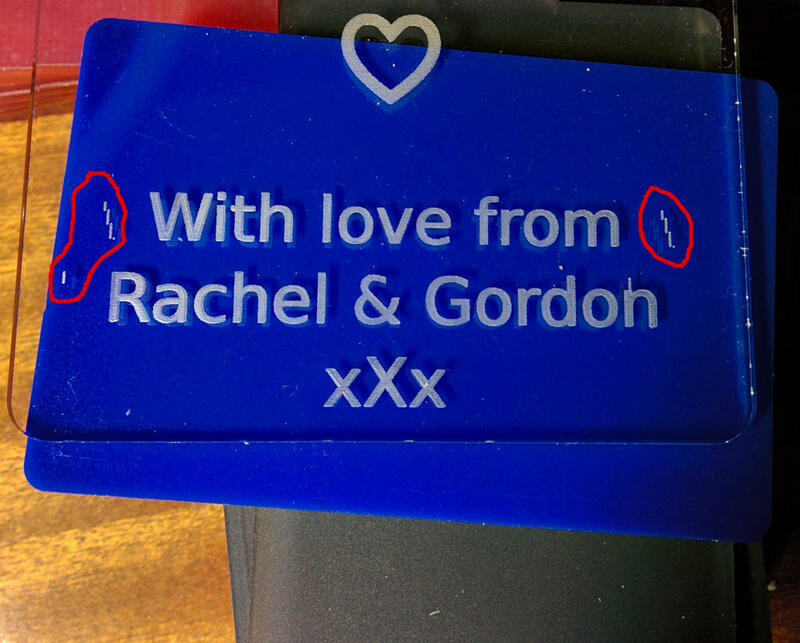 Are you only getting these 'glitches' when engraving ? I think those are related to engraving. I also had some of them: http://redmine.laoslaser.org/issues/47. Are you using the latest firmware? However I've just run another cut using the same SD card image - and got the glitches in exactly the same place. However the place is different in the very first version of that plaque I made - I've only shown a small part of it - but I'd made a mistake in some of the text above that photo - and the glitches were elsewhere. As for the firmware - not using the new one released a few days ago, but the version I am using is dated 14th May 2014. Last try before bed... Went back into Inkscape, trying to follow the issue 58.. nothing was grouped, but I selected all & ungroup anyway, then convert to path, but I don't know how to "split paths". I'm very new to Inkscape. There is "Cut Path", and "Break Apart" options, but I can't find a "Split Path" option or anything close. I think we want to switch to github for issues, so I started a issue there and tried to assemble the relevant links. Again help with the previewer would be appreciated. Has anyone tried exporting from Inkscape as a different format - ie. not SVG? Would it make a difference? Are you sure, you are using the latest firmware version? I did not observe those glitches for a long time now, so I assumed they were fixed. Anyway, if you need to engrave something urgently: The glitches seem to be always at the end of engraved stuff, so adding a thin frame in your engraving, which is outside your workpiece should save you, eventhough it makes the job duration much longer of cause. If you are using VisiCut, the input file format can not matter, because visicut rasters the images internally and only gives the result to the underlying LAOS driver. Masking isn't going to be possible here, but the glitches seem to move every time I change the file in Inkscape and re-run it through VisiCut, so maybe I can find a combination that puts them in a less obtrusive place. Not a long-term solution though. I might look at the visicut viewer though - I think it would be good to isolate the issue - VisiCut or the firmware - I think it's hard to tell right now. On a whim, I decided to take my original in Inkscape and take the bottom 3 lines - the ones in the photo above which is about 1/4 of the whole plaque and moved them to another layer (I use the layers method of specifying cut/engrave, etc. type in VisiCut). I intended to only laser cut the outline and engrave the top 3/4, then send the bottom 1/4 as a separate file, but decided to do the lot. So I selected one layer to be cut, and 2 layers to be engraved - sent it to the LAOS board and bingo. The output - on cardboard at least is perfect. That still doesn't tell me if the issue here is with Inkscape, VisiCut or the LAOS firmware, but at least I have a workaround for now, and maybe this might help someone else with a similar issue. Did anyone experiment with the Additional space per raster line option in Visicut? This allows you to tweak the distance the laserhead sweeps outwards beyond the width of the raster line. By looking at those line-bitmap-data you can clearly see that everything looks pretty correct so far. Visicut generates the bitmap data with a lead-in and lead-out area of at least 64 bits which are those double zeros in every line starting with a 9 (for bitmap transfer). Now it is clear that the issue is not on the Visicut side and also the transfer of the file is not the issue! By using pos_l the next pixel to be put on the laser is retrieved, but here is no check against bitmap boundaries. So our understanding to the error is the following: If something goes wrong with the mapping between pos_l and the area over that the laser is moving - for example moving one point too far - the laser will pick bitmap data from outside the bitmap area filled prior with the last "9" command! That explains why this error only appears if in the past this bitmap data was filled with more data - here by the triangle that is getting bigger and bigger from top to bottom. By turning off bi-directional engraving (which didn't work correctly due speed issues, but let's dig that down later...) we got the prove of our assumption: The miss-firing only occured at the END of the bitmapped line - so the error is that pos_l is counting too far (very likely just by one pixel). With this patch the issue disappeared proving the erratic behaviour of the firmware. I'll try to compile with your patch, could you test it? yes I can test it, if not today than within next 2 days. By uploading the drei.lgc file it should be reproduceable on any Laos laser (but you have to laser this file at least twice). Thank you for your effort. Anyhow, can you explain me how this bitmap-thing should work? Does it use a specific length-per-pixel or does it automatically map the pixelcount over the whole length of the next line? Build it. Please try it. I will be able to try it on Tuesday. Great work for tracking this down! As the index is calculated there might well be a +/- 1 calculation error. Zeroing the original data is indeed required. Luz/Peter: As for the definition of the raster line: the bitmap data is mapped at equal pixel spacing between the startpoint and endpoint of the next "line" command. So if the raster data is 1000 pixels, and we move 100mm during the next move: 1 bit equals 100mm/1000pixels = 0.1mm. "9 1 160 0 0 134217728 0 0"
Note that the line can be in any direction (you can raster diagonally). I've written a "offline" simulator before in c# that interpreted a LGC file (code is no longer online). Can dig locally if I can find the code. Trying to fix this in Visicut is not the right direction (it will become a mess). The firmware fix is trivial, and we will implement and test it. I just tested. Without patch, the triangle makes misfires when engraved twice. With patch, the misfires are gone. I tested it now myself and it works with the new Firmware. Cancel button now also, but I start a new thread for that now.